Marklin, the German toy manufacturer who originated O scale around 1900 chose the 1/48th proportion because it was the scale they used for making doll houses. In O scale 1/4 inch equals 1 foot. Interestingly, O scale was originally called Zero Scale, because it was a step down in size from 1 scale. 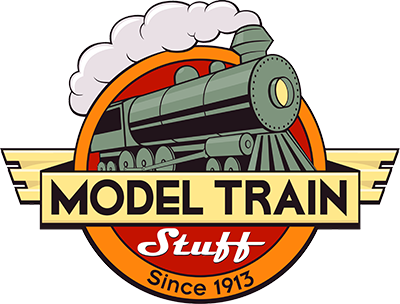 From the 1920s until after World War II, O scale dominated the model train market. But as model trains became more affordable for the average person, the space required to set up the tracks became a major consideration in purchasing model railroad trains. HO has the broadest range of products from the greatest number of manufacturers. In HO scale 3.5mm equals 1 foot. The designation HO stands for "Half O". Of course if it was actually one-half of O scale it would be 1/96th, but because HO is actually a metric based scale and O is based on English units of measure the fractions become awkward. The model railroading industry says HO is "approximately half O". The "N" is short for nine millimeter (although the actual gauge is 8.97mm). In N scale 2mm is approximately 1 foot. N scale is the second most popular scale worldwide. Many modelers select N scale as an alternative to HO scale because it allows more complex layouts to be built in the space available to them. Traditional thinking is that N scale trades detail for space. However, modern manufacturing and painting processes are producing N scale models with surprising levels of detail today. Prior to 2008, Z scale was the smallest commercially available scale in model railroading. Z scale is popular with apartment dwellers and others with very limited layout space. Z scale is awkward mathematically, approximately 0.0545 inches to the foot, but that doesn't hurt its popularity. Z scale is the fastest growing scale in model railroading today. Some Z scale manufacturers offer briefcase layouts; entire track layouts with landscape, buildings, and a power supply all in a briefcase. These are high-end executive toys that sell for around $1,000.